The two C-S bonds in this molecule are not the same (and similarly for the CF3 analogue), one being long (single), the other short (assumed triple), and the angle subtended at the central carbon is around 150° (B3LYP/cc-pVTZ calculation, DOI: 10042/to-3643). The transition state for interconverting one form to the other would presumably correspond to the concerted movement of two pairs of electrons from one CS region to the other as shown above, not so much a Ménage à trois, as a Ménage à deux! The transition state itself (DOI: 10042/to-3644) has C2 symmetry, with a calculated free energy barrier of 31 kcal/mol and ν 284i cm-1 for the bond shifting process. 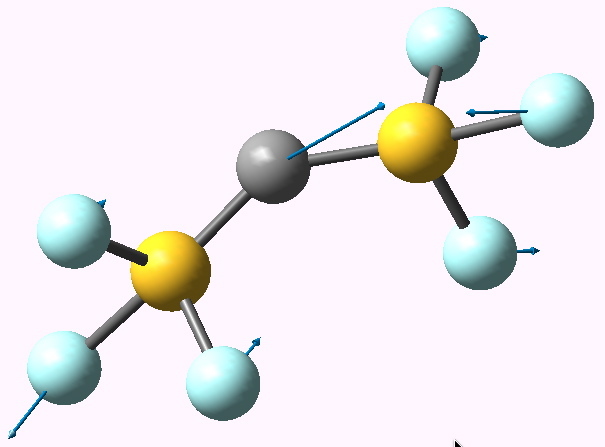 The molecule above does have a further point of interest; one of the sulfur atoms (the triply bonded one) is approximately tetrahedral in coordination, whilst the other has a “T-shape”. An inorganic chemist would describe one sulfur as tetravalent (oxidation state IV), the other as hexavalent (oxidation state VI) and the equilibrium between them a dismutation of the two oxidation states. Does this have any reality? The ELF method has been mentioned a number of times in these posts, and it is applied here to seek an answer. The ELF basin centroids are shown below. 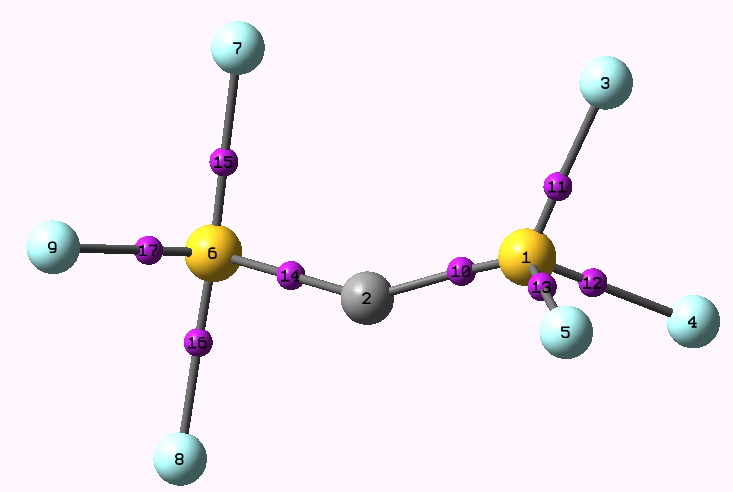 The integrations are as follows: 14 = 2.24 (a single C-S bond), 30=1.66 (an incipient carbene forming, as implied above), 13+15+16 = 4.34 (a reasonably persuasive triple bond, comprising, unusually, three separated basins). 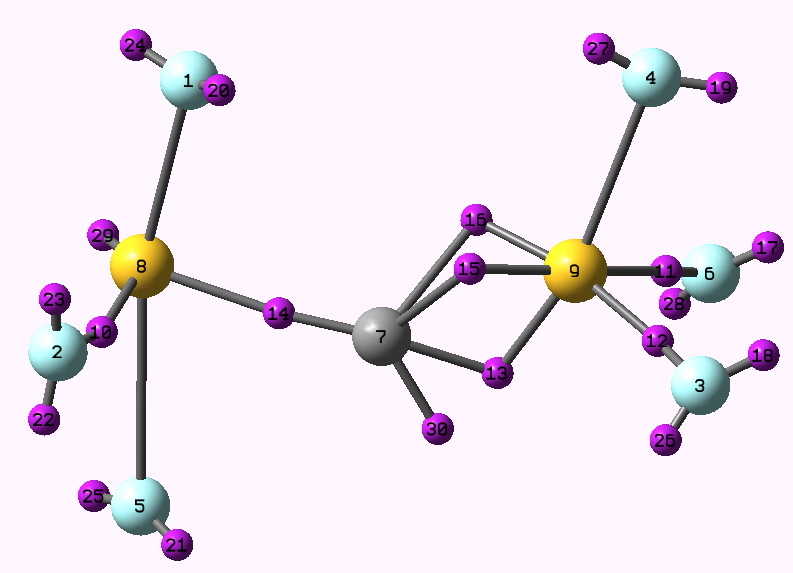 The fluorines 2, 3 and 6 all exhibit bonding basins to the S (respectively 2.17, 2.17 and 2.09), but fluorines 1,5 and 4 do not! 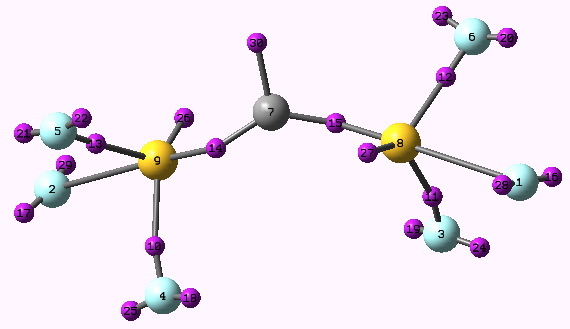 Sulfur 8 additionally has a lone pair, 29=2.31, but sulfur 9 does not. One aspect of this analysis is the nature of the triple bond between S9-C7. Because the three basins are separate, does that mean that the bond cannot rotate about its axis? An alternative AIM analysis is shown above. Now, the CS triple bond is reduced to a single bond critical point (BCP), labelled 10. AIM allows a property known as bond ellipticity to be computed at that BCP. Typically, single and triple bonds have ellipticities close to zero, whilst double bonds have a value of around 0.4 to 0.5. That for point 10 is 0.18, which seems to support the ELF analysis above. Pretty unsual bonding it would have to be agreed! ELF centroids for transition state for dismutation. But what of the original question posed at the start in the diagram; do two pairs of electrons move away together from one triple bond to form another. A further ELF analysis at the transition state for this process reveals that in effect the two pairs do different things. One localizes onto the carbon, to form a proper carbene, the other becomes a sulfur lone pair. So the valence dismutation involves three pairs of electrons, not two as shown at the start, with each pair doing its own thing. This entry was posted on Wednesday, December 30th, 2009 at 10:45 pm and is filed under Hypervalency, Interesting chemistry. You can follow any responses to this entry through the RSS 2.0 feed. You can leave a response, or trackback from your own site.